The Bigger Smart Cart is a patented multipurpose folding basket that is perfect and convenient for anyone on-the-go. Unlike an ordinary basket, this Folding Basket has wheels and an extendable handle for easy maneuverability. Ergonomic curvature in the long handle allows you to pull heavier loads using less force. The handle extends to 47". Nonslip rubber grip is custom-molded for a comfortable ergonomic handle. This basket is perfect for groceries, laundry, books or any other items you need to haul around. It also offers a front pocket for easy access items. 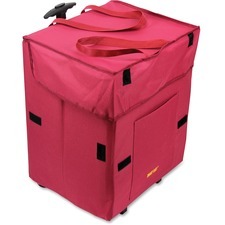 The basket folds down to only 2" for compact storage. It weighs less than 4 lb. It has 35 percent more room than the dbest products' Original Smart Cart and holds 125 lb. The Bigger Smart Cart is designed with a double handle for easy loading. Solo Vector Carrying Case (Backpack) for 16" Notebook - Black - Polyester - Shoulder Strap, Handle - 19" Height x 12" Width x 7" Depth Laptop Backpack features a padded compartment with hook-and-loop closure to protect laptops with up to 16" screens. 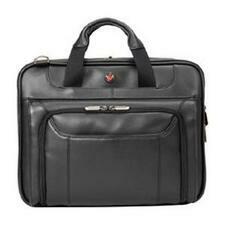 Mesh accessory pockets in main compartment provide storage for power cord, block, and other laptop accessories. Zippered front organizer holds business cards, USB memory sticks, keys, pens and other personal items. Mesh side pockets offer fast access to water bottle, umbrella and other items you may need while on the go. Exterior zippered pocket gives you additional storage. Padded, adjustable backpack straps and padded back panel make carrying heavy loads more comfortable. Cushioned carry handle offers an alternate carrying option. Ergonomic zipper pulls are contoured to fit your thumb. 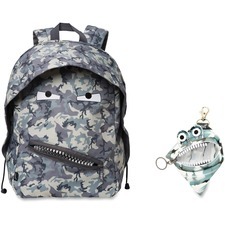 At school, around town or on the go, Grillz Large Backpack is a stylish way to take along everything you need. The exterior pocket unzips to reveal some snazzy grillz which, along with the eyes and hood detail, make this backpack a force to be reckoned with. 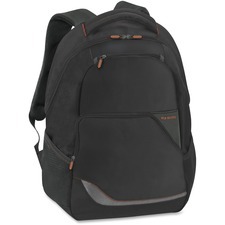 It features a padded back and adjustable shoulder straps for added cushioning and comfort. It's big enough for books, binders, clothes, a tablet and other gadgets, snacks, water bottle and more. Durable construction and hip, practical design include one large interior pocket and one small exterior pocket. Mini pouch is made of durable fabric and is secured with one long zipper. It's flexible enough to squeeze comfortably into any bag. 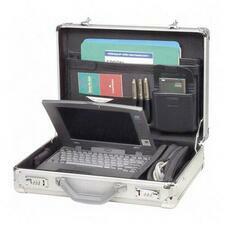 Deluxe catalog case offers convenience and durability. Patented piano hinges covered with a protective vinyl extrusion allow the top flaps to open wide for easy access. 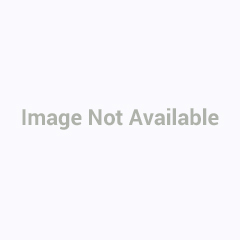 Design includes protective T-Rail bumper edge, brushed brass twin keylocks and padded steel shell handle. The case interior features two full-size flexible dividers on the inside and organizing pocket under the flap. 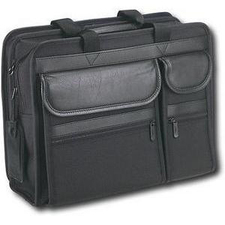 The Targus Leather Corporate Traveler toploading case is designed to fit 14" widescreen laptops and will also fit laptops with extended batteries. Weighing just 3 pounds, this case features lightweight and quality leather fabrication and also features the patented SafePort Air Cushion System to help prevent drop damage. This protection system features adjustable cushions inside of the case to protect your laptop while providing a snug fit for smaller sized laptops. The Ultra-Lite Corporate Traveler case features a zip-down workstation with business card holder, three pen loops, key clip and multiple accessory compartments to keep your accessories organized. The dedicated file section also helps to organize documents while on the go. For added comfort, the case includes a padded ergonomic shoulder strap with a non-slip coating to keep the pad in place on your shoulder. Constructed of durable leather material, this case is built to withstand the wear and tear of everyday business travel..
Show your support for breast cancer research with a Pink Ribbon Leather Tote. Day-Timer will donate a portion of the proceeds from this product to The Breast Cancer Research Foundation. 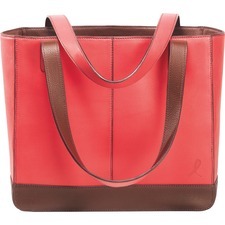 Open Tote offers unique color and style with pebble-grain leather in rich pink and a debossed pink ribbon emblem. Rich chocolate brown accents and interior add contrast. 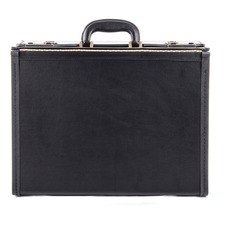 Large open compartment holds files or personal items. 9" interior zippered pocket secures small items. Two additional interior pockets hold cell phone and calculator. Double handles have an 8-1/2" drop.